Richard Rand, “Jean Honoré Fragonard/Love as Folly/c. 1773/1776,” French Paintings of the Fifteenth through Eighteenth Centuries, NGA Online Editions, https://purl.org/nga/collection/artobject/33745 (accessed April 25, 2019). “[D]es plus agréables,” Leroy de Senneville sale, Desmarest, Paris, April 5, 1780, no. 56; quoted in Pierre Rosenberg, Tout l’oeuvre peint de Fragonard (Paris, 1989), 127 (Georges Wildenstein, The Paintings of Fragonard: Complete Edition [New York, 1960], 271). a characterization that would be hard to defend today, their state of preservation notwithstanding. See Pierre Rosenberg, Tout l’oeuvre peint de Fragonard (Paris, 1989), 103. The subjects were also engraved at least twice during Fragonard’s lifetime, a further indication of their popularity. “Sur buisson / Le papillon / Voit-il la rose, / Il s’y repose. / Est-il heureux / Amant frivole / Soudain il vole / A d’autres jeux” (Roger Portalis, Honoré Fragonard: sa vie et son oeuvre, 2 vols. [Paris, 1889], 102, 197 – 198). The lines are from “Eclogue,” in Oeuvres choisies de Parny (Paris, 1826), 306 – 310. These works also reminded the Goncourts of the poetry of Parny (Edmond de Goncourt and Jules de Goncourt, L’art du dix-huitième siècle, 2 vols. [Paris, 1880 – 1884], 2:326). As if that were not enough, Fragonard also gives us doves — the birds of Venus — and rosebushes, which with their sweet scent but prickly stems offer, as does love, both pleasure and pain. This text was previously published in Philip Conisbee et al., French Paintings of the Fifteenth through the Eighteenth Century, The Collections of the National Gallery of Art Systematic Catalogue (Washington, DC, 2009), 172–176. Possibly Jean François Leroy de Sennéville [1715-1784], Paris; possibly (his sale, Chariot and Paillet at Hôtel de Bulion, Paris, 5-11 April 1780, no. 56); possibly purchased by Verrier. possibly Marquis de Véri; possibly (his sale, Paillet, Paris, 12 December 1785, no. 39); possibly purchased by Millin. possibly Folliot; possibly (Folliot sale, Regnault, Paris, 15 April 1793, no. 50). Marquis des Isnards; (Wildenstein, London, New York, and Paris); probably held jointly with (Ernest Gimpel, New York); sold 1905/1906 to John Woodruff Simpson [1850-1920], New York; by inheritance to his widow, Katherine Seney Simpson [d. 1943], New York; by inheritance to her daughter, Jean W. Simpson [1897-1980]; gift 1947 to NGA. Georges Wildenstein wrote to Fern Shapley that his father had purchased this painting and its pendant, Love the Sentinel (NGA 1947.2.2), from the marquis des Isnards, whose unwritten family tradition was that they had owned the pair since they were painted (letter of 21 June 1948, in NGA curatorial files). The "CA" numbers on the stretchers of both paintings, and the corresponding prospectus for the pair (in NGA curatorial files) indicate that they were on consignment with M. Knoedler & Co. at some time during the Simpsons' ownership. Love as Folly and Love the Sentinel were executed on medium-weight, plain-weave fabric. Both paintings are oval-shaped, and though they have been lined and the original tacking margins have been removed, cusping indicates that they retain their original dimensions. The ground consists of three layers: a moderately thick white layer, a thin red layer, and a thin gray layer. Large particles, possibly sand or coarse pigments, were mixed into the ground to produce a subtle surface texture. The paint was applied in multiple opaque and glazed layers. Glazes were used to create the flowers and to delineate stems in the bushes. In Love the Sentinel, there is low impasto in the flowers and brushmarkings in the pale colors of the putto, the foreground, and some of the clouds. There are fewer brushmarkings and no impasto in Love as Folly. The structural condition of the paintings is good, but the visual condition is rather poor. The impastoed brushstrokes have been slightly flattened, and the tops of them are dark with surface grime. There are sigmoid cracks in the sky of Love as Folly, and there is a significant amount of inpainting in this area. Both paintings have inpainting along the perimeters; it has discolored significantly, but it is hidden by the frames. The varnish has yellowed significantly, and although it appears to have been thinned, it remains disfiguring, with numerous areas of discolored residues. Goncourt, Edmond de, and Jules de Goncourt. L'art du dix-huitième siècle. 2 vols. Paris, 1880: 2:326. Portalis, Roger. 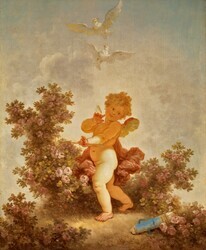 Honoré Fragonard, sa vie et son oeuvre. 2 vols. Paris, 1889: 62, 102, 270. Nolhac, Pierre de. J.-H. Fragonard. Paris, 1906: 156. Dayot, Armand and Leandre Vaillat. 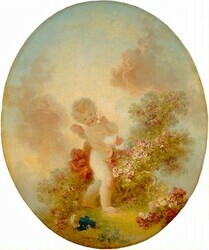 L'Oeuvre de J.-B.-S. Chardin et de J.-H. Fragonard. Paris, 1907: 14, no. 108, repro. Einstein, Lewis. "Looking at French Eighteenth Century Pictures in Washington." Gazette des Beaux-Arts. 6th ser., vol. 67, no. 1048-1049 (May-June 1956): 244, repro. 245. Réau, Louis. 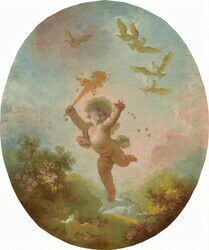 Fragonard: sa vie et son oeuvre. Brussels, 1956: 146. Wildenstein, Georges. The Paintings of Fragonard. New York, 1960: no. 319, repro. Summary Catalogue of European Paintings and Sculpture. National Gallery of Art, Washington, 1965: 51. European Paintings and Sculpture, Illustrations. National Gallery of Art, Washington, 1968: 44, repro. Mandel, Gabriele. L'Opera completa di Fragonard. Milan, 1972: no. 344, repro. European Paintings: An Illustrated Summary Catalogue. National Gallery of Art, Washington, 1975: 132, repro. European Paintings: An Illustrated Catalogue. National Gallery of Art, Washington, 1985: 158, repro. Cuzin, Jean-Pierre. "Jean-Honoré Fragonard: Vie et oeuvre." Fribourg, 1987. English edition New York, 1988: 308, nos. 354-355. Rosenberg, Pierre. 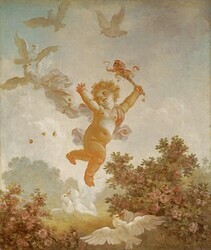 Tout l'oeuvre peint de Fragonard. Paris, 1989: 102, no. 286-287. Conisbee, Philip, et al. French Paintings of the Fifteenth through the Eighteenth Century. The Collections of the National Gallery of Art Systematic Catalogue. Washington, D.C., 2009: no. 34, 172-176, color repro. “[D]es plus agréables,” Leroy de Senneville sale, Desmarest, Paris, April 5, 1780, no. 56; quoted in Pierre Rosenberg, Tout l’oeuvre peint de Fragonard (Paris, 1989), 127 (Georges Wildenstein, The Paintings of Fragonard: Complete Edition [New York, 1960], 271). See Pierre Rosenberg, Tout l’oeuvre peint de Fragonard (Paris, 1989), 103. Georges Wildenstein, The Paintings of Fragonard: Complete Edition (New York, 1960), 19. See Jean-Pierre Cuzin, Fragonard, Life and Work (New York, 1988; French ed. Paris, 1987), nos. 249 – 251; Pierre Rosenberg, Tout l’oeuvre peint de Fragonard (Paris, 1989), nos. 157 – 160. Georges Wildenstein, The Paintings of Fragonard: Complete Edition (New York, 1960), 271. For the gouaches (Alexandre Ananoff, L’oeuvre dessiné de Jean-Honoré Fragonard, 4 vols. [Paris, 1961 – 1970], 2: nos. 1000, 1001), which belonged to the important collector marchal de Saincy (his sale, Paris, April 29, 1789, and days following, lot 79), see Fragonard, le peintre de la ville des parfums (Grasse, 1995), 32 – 33. Of the extant paintings, Janinet’s prints are closest to the Simpson versions, although they do not reproduce them exactly. 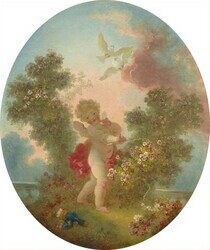 A print after Love the Sentinel was also made by Simon Charles Miger in 1779; all three prints are reproduced in Pierre Rosenberg, Tout l’oeuvre peint de Fragonard (Paris, 1989), 102, nos. 284a, 284b, 285a. “Sur buisson / Le papillon / Voit-il la rose, / Il s’y repose. / Est-il heureux / Amant frivole / Soudain il vole / A d’autres jeux” (Roger Portalis, Honoré Fragonard: sa vie et son oeuvre, 2 vols. [Paris, 1889], 102, 197 – 198). The lines are from “Eclogue,” in Oeuvres choisies de Parny (Paris, 1826), 306 – 310. These works also reminded the Goncourts of the poetry of Parny (Edmond de Goncourt and Jules de Goncourt, L’art du dix-huitième siècle, 2 vols. [Paris, 1880 – 1884], 2:326).